I’m super excited to announce our very first donation to the community! So you know how we work with brands to do toy reviews? Well … This time we did something a little different. Through a collaboration with Ohio-based toy company Simplay3, we were able to review one of Simplay3’s Sharing Libraries by documenting our experience with donating it to the community. And what a blast it’s been! We received one Sharing Library for free in exchange for our review. As always, all opinions are my own. For more info, see my disclosure. The stand, which is installed outdoors, is made of sturdy plastic (just like Simplay3’s popular chunky backyard toys) which makes the Sharing Library great for all types of weather. The box comes in a pretty red color, which is awesome because it matches well with the kids’ museum firehouse theme. It’s a good height for kids and it’s door is easy for little hands to open. The Sharing Library retails for 149.99 on the Simplay3 website. You can also find it in my Amazon Influencer Shop! (affiliate link). 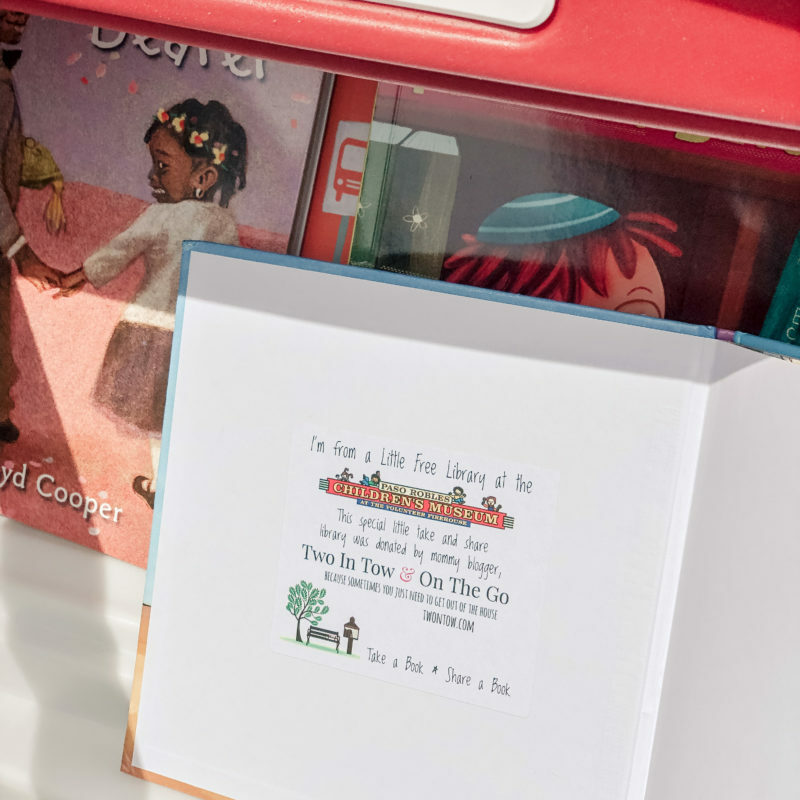 The public is invited to “Take a Book, Share a Book” at the Paso Robles Children’s Museum’s Little Free Library now installed at 623 13th St. in downtown Paso Robles, Calif. 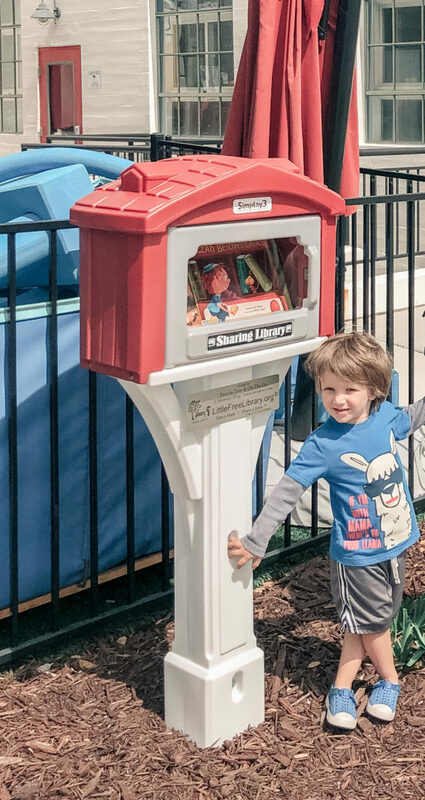 Designed by American company Simplay3, this Sharing Library is a modestly-sized box on a stand that reaches nearly 5 feet tall and features a clear plexiglass door so the books stored inside are clearly visible. All you do is open the little door to take a book + leave a book. The box is registered as an official @littlefreelibrary so it shows up on the organization’s map as charter #84178. It’s one of five boxes in our city. 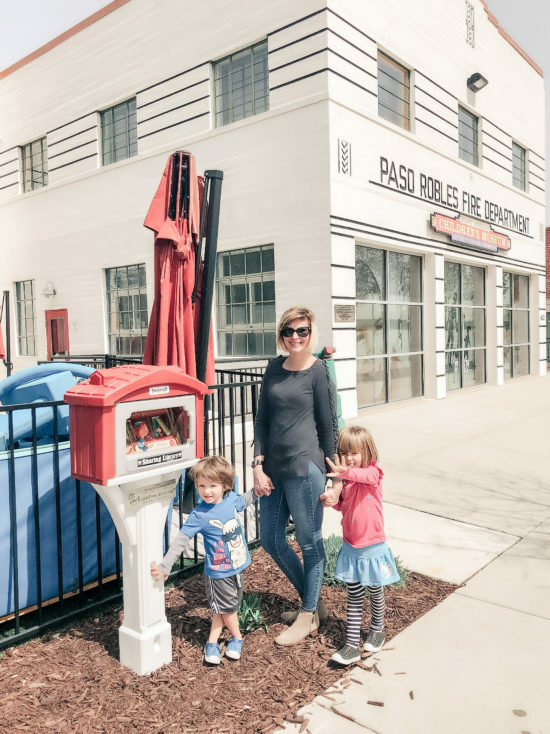 Bring a new or used children’s book to the Paso Robles Children’s Museum’s Little Free Library box, located outside on the edge of the museum’s outdoor play area facing 13th Street. The books are free and the box is accessible 24/7. Leave your book in the box. Take a book someone else left behind. Those using the sharing library can park on the street or in the museum’s lot located behind the building. You don’t need a museum membership to use the Little Free Library outside. In fact, to help your kiddos with this little lesson in sharing, I suggest you bring a used or new book with you on your next trip to the children’s museum so you can stash it inside the Sharing Library and take home a new-to-you one! Overall, this has been a neat experience sharing one of our toy testing partnerships with the community. Usually the kids toy test one product and either they keep it or I host a giveaway for it on Facebook. (I prefer to share the love). But this was the first time where the actual product testing will play out in the community. I’ll be updating our experience with it over time. 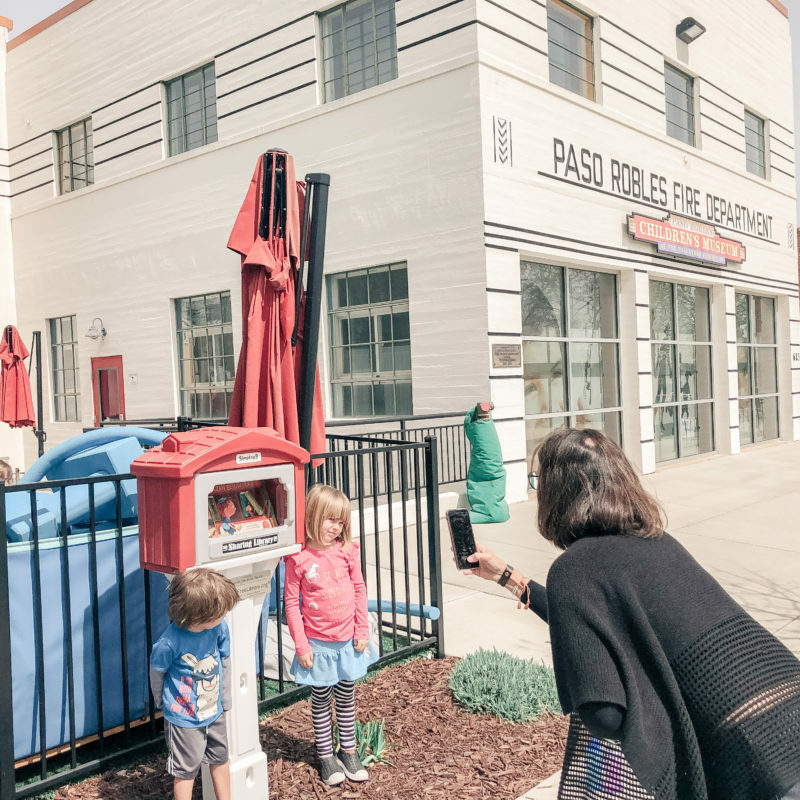 The Paso Robles Children’s Museum is a non-profit organization that works to engage children in a joyful learn-through-play environment and inspire educational curiosity. (We play there all the time). And it turned out to be the perfect spot for a neighborhood sharing library filled with childrens books. The project also served as a handy teaching moment for 3- and 5-year-old Wyatt and Clara. When we talk about parenting goals, as a mom I’m usually focused on things like surviving the wrath of my hungry 5 year old and keeping pants on her 3 year old brother. But, you know, I also want to teach the kids to be kind, to share and to generally be good humans. I can say first hand that it often hard to find meaningful ways to do that. One thing, though, is we love books at our house. So my hope is that the simple action of kids in the community sharing their books with each other at such an awesome gathering place like our local children’s museum helps bring little more joy and human kindness to everyone. Secretly, I had been hiding this box in a cardboard box in our garage for months while I researched possible recipients, pitched them and worked out all the little details. But during all this, the kids had no idea what was in this mystery box (pretty sure I just said toilet paper lol). And I couldn’t really show them either, because, the meme is true: the secret of kids is you don’t talk about activities until you’re fully prepared to act upon said activities. So I had to keep it a secret until I was ready to show them what the project was all about. Once the kids saw it installed at the museum, I explained the whole thing and they immediately wanted to take a book and leave one behind. And we hope you do, too! “We can just take a book? !” Clara asked, wide eyed. “It’s just like at the library!” I hope to gather a handful of well-loved books in her room to trade in as well. We plan to revisit a few times a month so the kids can do that again and again, and hopefully see how the same book trades bring other kids joy, too. The Paso Robles Childrens Museum printed up these cute labels for the books. Paso Robles Children’s Museum Executive Director Jennifer Smith snapping pics of the kids with the new sharing library. Luckily, Children’s Museum Executive Director Jennifer Smith was more than happy to give the Sharing Library a home, have it installed and even stock books in it. Jennifer made this process so easy and she was just so cool and approachable about it I can’t say enough nice things about her or the process. She even printed up the cutest labels for the inaugural books she stashed inside. 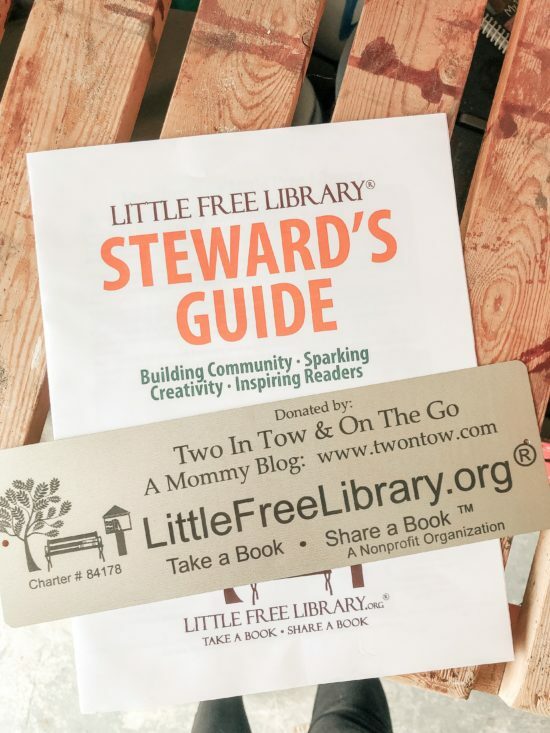 Little Free Libraries, registered through a nonprofit organization of the same name, are part of a global movement designed to connect communities through the love for reading and the spirit of generosity. There are 36,000 sharing boxes around the world in 70 countries, according to LittleFreeLibrary.org. In fact, 2019 marks the 10th anniversary of the first Little Free Library. Meanwhile, Simplay3 designed its Sharing Library model to be a magnet for kids in the neighborhood and a way to bring the entire community together, all generations, to connect and learn. See more about this cool company below. We’ve also tested two other products from these folks, including the Carry and Go Track Table and the very fun Trail Master 2-Seat Wagon. 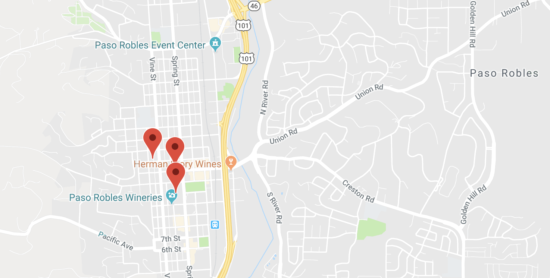 In Paso Robles, four Little Free Libraries are registered on the organization’s map, including one near Lake Nacimiento. 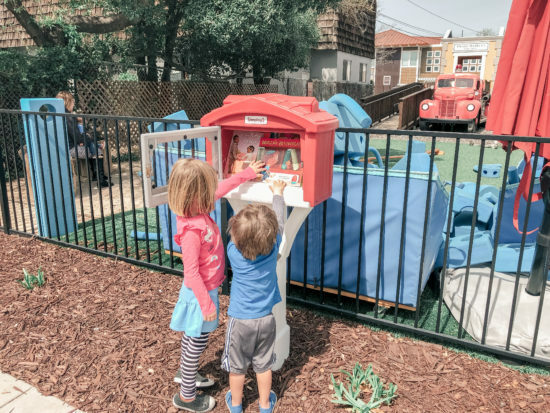 The children museum’s Little Free Library was installed in March 2019. Based in Northeast Ohio, Simplay3 is the third endeavor from the founders of popular toy companies Little Tikes and Step2. Its products are made in the USA, recyclable and designed to promote interactive, imaginative unstructured play for children. Its offices and manufacturing plant are located at 9450 Rosemont Drive, Streetsboro, OH. The Simplay3 Sharing Library retails at $149.99. You seriously out did yourself with this! It is such a wonderful idea and should go nationwide!!!! Thank you for such a beautiful thing!!! !